Bahraini human rights activist Zainab Al-Khawaja will appear before the Bahraini court of appeals on 21 October to hear its verdict on charges including ripping a picture of and insulting the king, for which she has been on bail since 2014. Al-Khawaja, the daughter of Abdulhadi Al-khawaja, former president of the Index award-winning Bahrain Centre for Human Rights, faces nearly five years in prison if her appeal is rejected. Al-Khawaja was sentenced on 4 December 2014 — just days after giving birth to her second child — on four charges which include two months for ripping the picture of the king, one year for insulting a police officer, three years for insulting the king and nine months for entering a restricted area. The Al-Khawaja family have been involved in Bahrain’s pro-democracy movement, making them targets for authorities in the monarchy. Zainab Al-Khawaja’s father, Abdulhadi, was sentenced to life imprisonment on 22 June 2011 for his peaceful human rights activities. 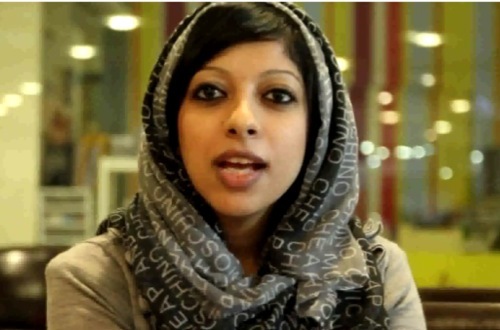 Zainab’s sister Maryam Al-Khawaja has been acting president of the Bahrain Centre for Human Rights since the arrest of Nabeel Rajab, another high-profile activist who has been subjected to judicial harassment for expressing opinions. A Thunderclap campaign has been launched urging people to wish her a happy birthday and call for her conviction to be quashed so that she and her year-old son don’t go to prison.